We don’t let bad weather get in the way of brunch. Jazzfest may be canceled today but we aren’t canceling a brunch opportunity. A jazz brunch at City Cafe was worth the journey through inclement weather and light flooding. We braved the weather apocalypse to bring you this week’s brunch review. When you enter you will immediately notice an eager and enthusiastic staff. Great service combined with delicious food makes City Cafe a must try. We only scratched the surface of their brunch menu! The atmosphere is very comfortable with fantastic, jazz music playing in the background. We enjoyed listening to John Coltrane and Dizzy Gillespie as we sipped our infused Bloody Mary. 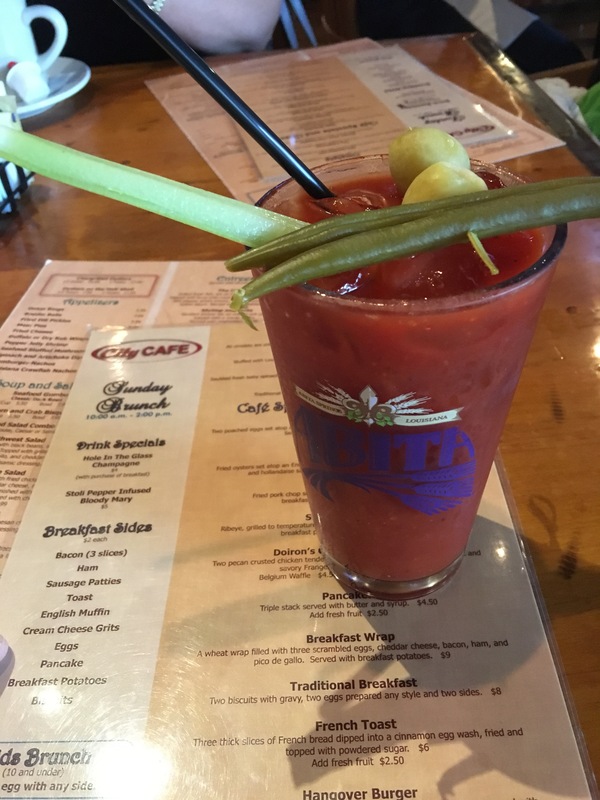 The Bloody Mary was on point and was infused with Stoli vodka–perfect. We appreciated the green beans and foliage! There is also bottomless champagne. As you know, we feel bottomless makes life better. We tried the meat pies. 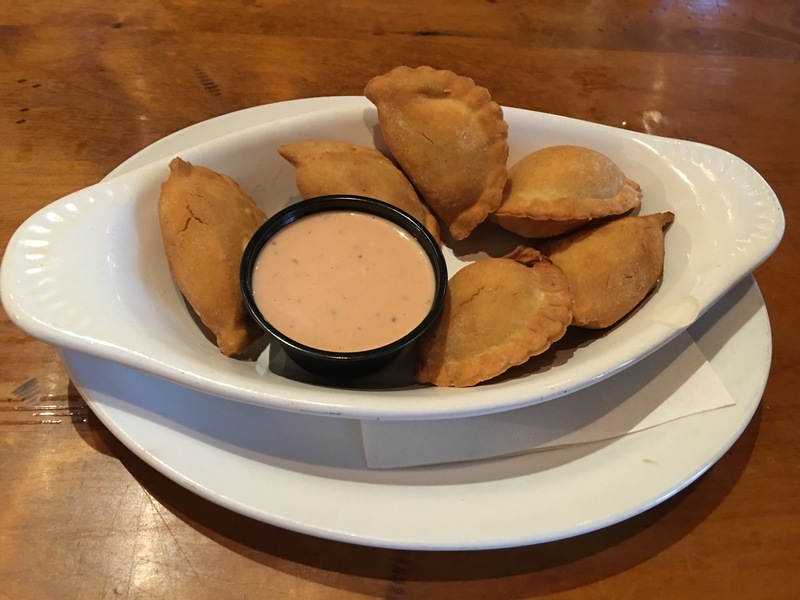 It was a good portion of bite sized meat pies and was well complemented with remoulade sauce. Great appetizer. There are many to try from. We will get the boudin next time. There are also oyster options. 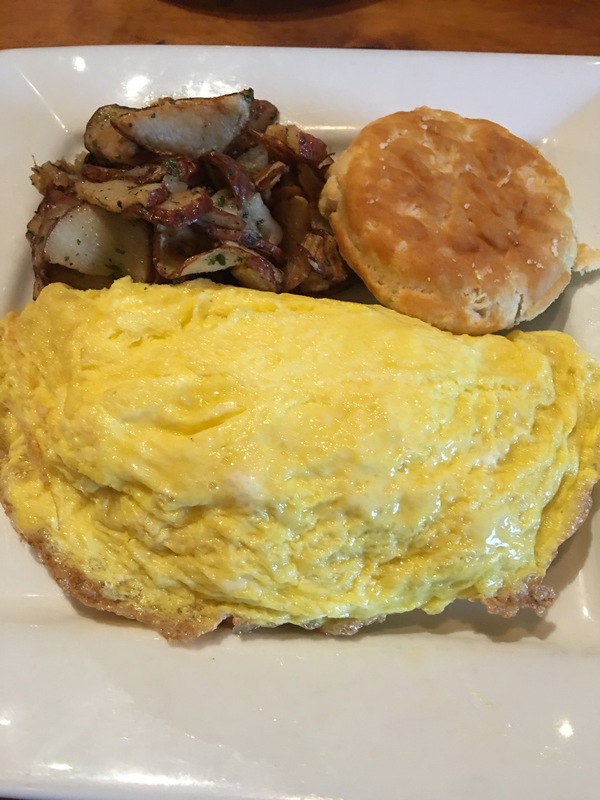 The Southerner is a stuffed omelet with crawfish, shrimp, crabmeat and pepper jack cheese. Creamy and a fantastic portion of seafood. It comes with a good portion of City Cafe potatoes and a biscuit. The potatoes were a side but were outstanding and worth getting. 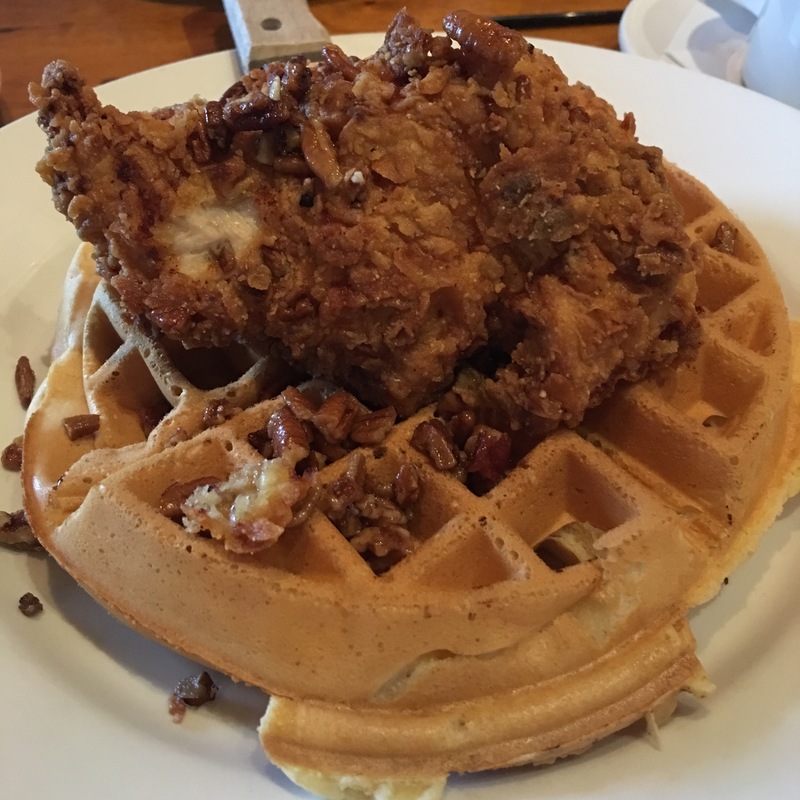 Dorin’s Chicken and Waffles is perfectly fried chicken tenders with pecan crusted exterior atop a waffle. The Frangelico maple syrup is a game changer! It’s got a sweetened flavor with a hint of spice. 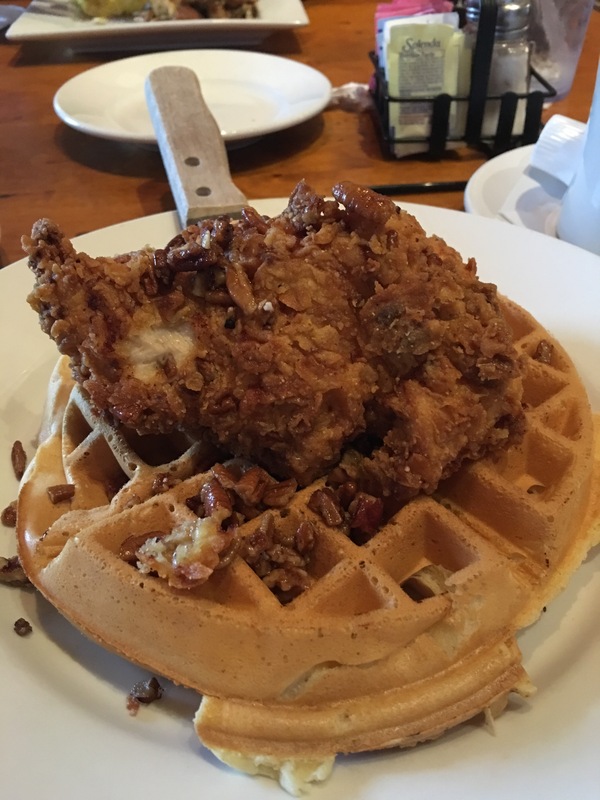 Perfect balance and one of the best put together chicken and waffle dishes in Baton Rouge. My favorite John Coltrane album is Giant Steps. This is a brunch of giant steps! Great atmosphere and well executed dishes that are full of flavor and perfectly plated for sharing. Family friendly and very much interested in the customer experience. 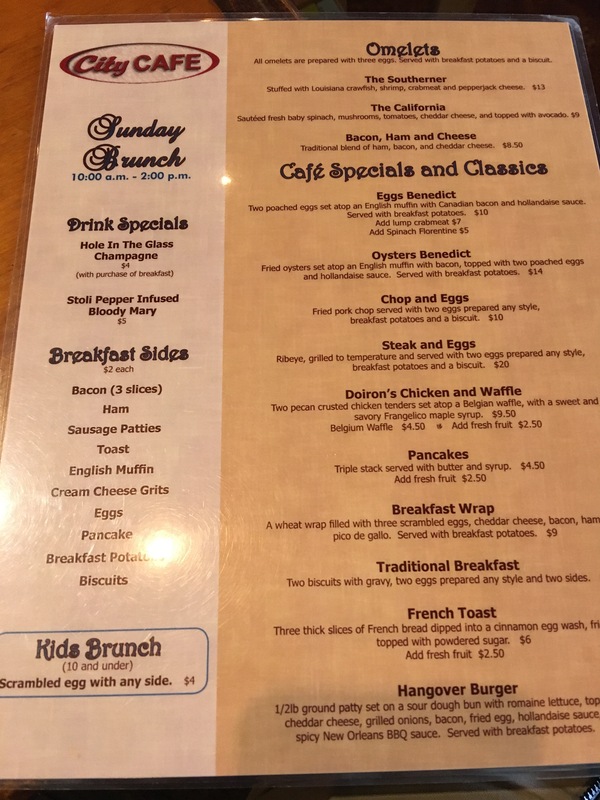 We only got a sampling of the brunch menu, and look forward to return trips to further explore. Baton Rouge Brunches approves! However it is spelled, it’s a fantastic dish!